NEW YORK — Home Depot posted record sales and earnings during its second quarter and raised its profit expectations for the year as the U.S. housing market continues to warm up. The home improvement retailers have been a bright spot as other shops like department stores are seeing sales slow, hurt by consumers who've shifted away from buying clothing and more toward experiences, fixing up their houses and services like spas. Atlanta-based Home Depot's profit jumped 9 percent to $2.44 billion, or $1.97 per share, edging out Wall Street expectations by a penny, according to analysts surveyed by Zacks Investment Research. Sales surged 6.6 percent to $26.47 billion, also slightly better than expected. Revenue at stores opened at least a year rose 4.7 percent. The measure is a key indicator of a retailer's health. The solid report came as government data showed continued health in the U.S. housing sector. The rate of home construction grew 2.1 percent in July, mostly because of an increase in apartment construction. It was the strongest pace of new home starts since February. New home construction had jumped 4.8 percent in June. Still, future gains may be limited because current housing starts are outpacing permits to build in the future. Authorized permits slipped 0.01 percent in July to an annual rate of 1.15 million. This week, the National Association of Home Builders with Wells Fargo released its builder sentiment index, showing that optimism among homebuilders is on the rise. 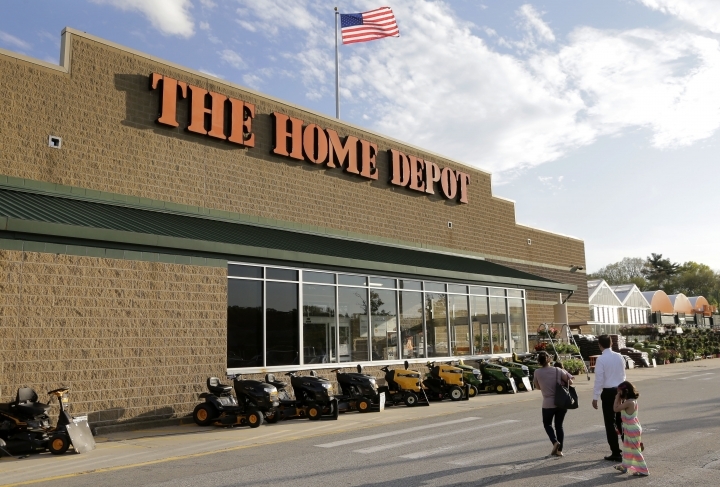 "We continue to see positive signs (from) the housing data, which we believe serve as a tail wind for our business," Home Depot CEO Craig Menear told investors Tuesday. He noted that business was strong across the board, led by appliances, which enjoyed double-digit percentage sales increases in sales at stores opened at least a year. One key reason for Home Depot's confidence: Transactions over $900, which represent about 20 percent of its U.S. sales, rose 8.1 percent in the quarter. Home Depot also has seen notable strength from its professional customers like plumbers and electricians. Sales from this segment grew faster than the average company's sales at stores opened at least a year. Furthermore, the gap between the highest- and lowest-spending professional is narrowing. The company is also expanding its online services and sprucing up its mobile features. Online sales rose 19 percent and represented 5.6 percent of total sales in the latest quarter. Home Depot said more than 50 percent of online traffic came from mobile and tablets in the latest quarter. Forty-two percent of online orders are now picked up at the stores. And 90 percent of its online product returns are processed at the stores. That's good news since customers are more likely to buy something when they're in the store. For several years, Home Depot has been offering services like allowing online customers to order online and pick items up at the store. But now it's shipping products from the store directly to online shoppers. It's in 700 stores and will be rolled out to all stores by year-end. Home Depot operates more than 2,200 stores. The change has helped tighten the delivery time to a two-hour window, a service that is helpful for professionals looking to have items dropped off at their work sites. Home Depot has also enlarged mobile images and added live mobile chat. It also simplified the check-out experience. The Home Depot Inc. boosted its full-year profit outlook to $6.31 per share from a previous per-share projection of $6.27. Its shares, up almost 4 percent this year, edged down 3 cents to $137.03 in midday trading Tuesday. AP Economics Writer Josh Boak in Washington, D.C., contributed to this report.